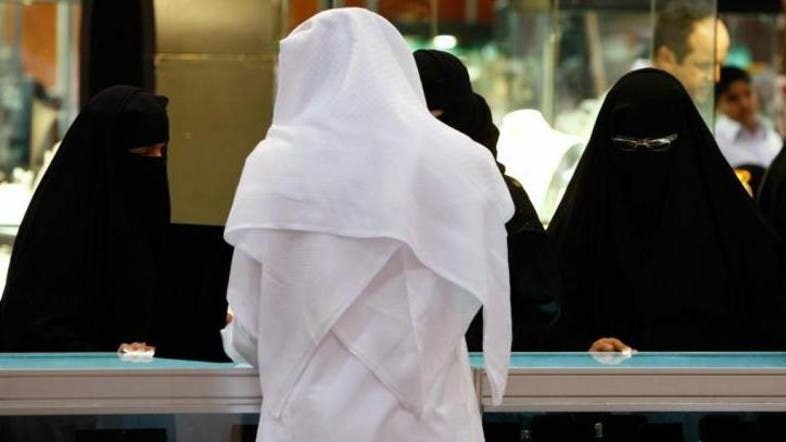 The Saudi cabinet has issued a decree which restricts the Saudi Committee of Promotion of Virtue and Prevention of Vice (often referred to as “religious police” by Western media) to pursue and arrest violators, and has required members of the Commission to report violators to the police or the anti-narcotics force, al-Riyadh Arabic language daily has reported. According to al-Riyadh, the above decision was part of a detailed decree which sought to organize the framework of the committee’s operation. The below is a translation of the report which is based on the cabinet minutes. 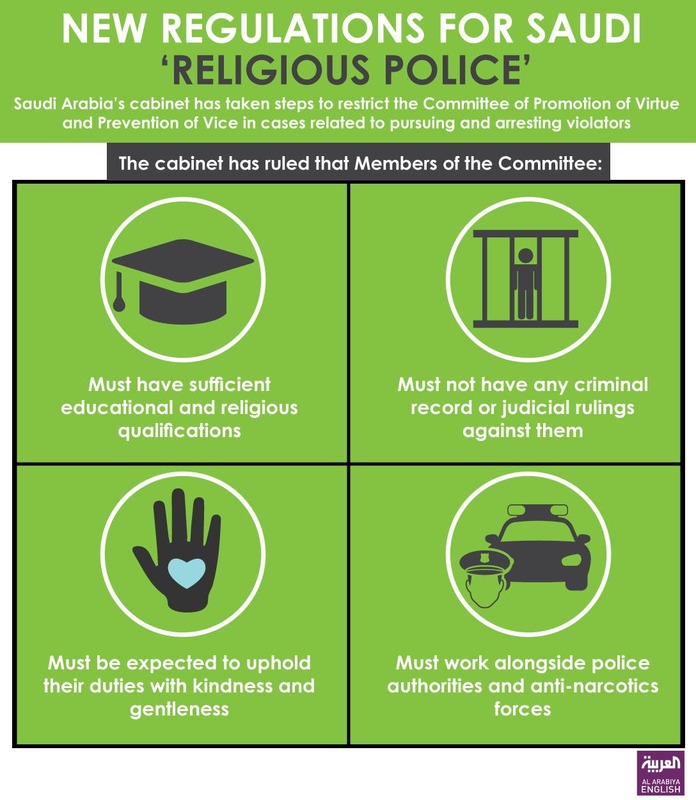 Infographic: New regulations for Saudi "religious police"
The Saudi Cabinet approved the organization of the General Presidency for the Committee for the Promotion of Virtue and Prevention of Vice. -	Agreeing on the organization of the general presidency of the Committee for the Promotion of Virtue and Prevention of Vice. -	The ministry of finance has been decreed to follow-up with the Committee for the Promotion of Virtue and Prevention of Vice and to provide complete support to its operations. 1)	The General Presidency for the Committee for the Promotion of Virtue and Prevention of Vice, and all subsequent branches beneath it, is an independent body that reports directly to the Prime Minister’s office. 2)	The president of the Committee for the Promotion of Virtue and Prevention of Vice will be a position appointed to the position of Minister and directly by royal decree. 3)	Every province will have its own branch of the Committee for the Promotion of Virtue and Prevention of Vice. The General President will be responsible of issuing orders to the branch committees. Each branch committees will then be responsible for dividing subsequent centers in each cities and towns depending on demand. 4)	The president will be responsible for running and issuing order of the branch committees and it has been decreed with such authorities of his department. a. Have sufficient educational qualifications, determined as such by the general presidency’s office. b. Have sufficient religious qualifications to promote virtue and prevent vice. c.	Have impeccable behavior and good reputation. d.	Would not have any criminal record or judicial rulings against him prior to time of joining and time spent in prison must not exceed one year sentence. 6)	The Committee for the Promotion of Virtue and Prevention of Vice is expected to uphold its duties with kindness and gentleness as decreed by the examples of Prophet Mohammed (peace be upon him). The committee is expected to work alongside official authorities from the police to anti-narcotics forces. a. The committee has the responsibility of reporting, while on patrol, to official authorities (depending on the suspected activity) any suspected crimes witnessed. Subsequent actions from pursuit of suspect, capture, interrogation and detainment will be left to the relevant official authorities. b. The committee will be allowed to perform their duties under article (6/f) of this decree in streets, public spaces and markets under their official work hours and schedule, each of which will be made official and publicized through each branch committee office. c.	Each branch head of committee will not be allowed to pursue, question, request identification and/or arrest and suspect as such protocol will be left to official authorities. d.	Each branch committee office will work accordingly under article (6/f) under its approved fiscal budget. e.	Each committee member is mandated to show his identification card while under official duty clearly stating: name, job title and description, official working hours and the branch committee he belongs/work under. 8)	The committee will work alongside an advisory board – made up of five members – whose main responsibility will include giving guidance and administrative advices (fines, stipulations, etc.) The office of the Prime Minister will name the five-man board. 9)	All public and private institutions are hereby mandated to follow and support the committee as outlined by this decree. 10)	The office of the Prime Minister shall issue the executive regulations of this organization. 11)	This decree is officially written into legislation and replaces the previous decree no. (73) passed on 16/3/1434H. 12)	This decree is hereby made official and to be publicized under official state media.